The book provides a comprehensive insight into an integrated, community-based approach to mental health care taking into account the specific cultural context of Cambodia. It started as an adaptation of the WHO manual Mental Health of Refugees (WHO, 1996), which describes common mental health problems in refugees and advises on how to help. Content was rewritten considerably, reorganized and substantial new material introduced, for example with regards to traditional beliefs and healing systems, to make it appropriate and meaningful for the Cambodian socio-cultural context and situation.” (Somasundaram et al., 1999). Vikram Patel (2003). Translated into Khmer by TPO Cambodia. Even though mental illnesses are common and cause great suffering in every part of the world, many health workers have a limited understanding about mental health and are less comfortable dealing with mental illness. This book is a practical manual for mental health care for the community health worker, the primary care nurse, the social worker and the primary care doctor, particularly in developing countries. After giving the reader a basic understanding of mental illness, the book goes on to describe more than 30 clinical problems associated with mental illness and uses a problem-solving approach to guide the reader through their assessment and management. This manual is developed by Ministry of Women Affair in collaboration with TPO Cambodia with funding support from The Asia Foundation & DFAT. 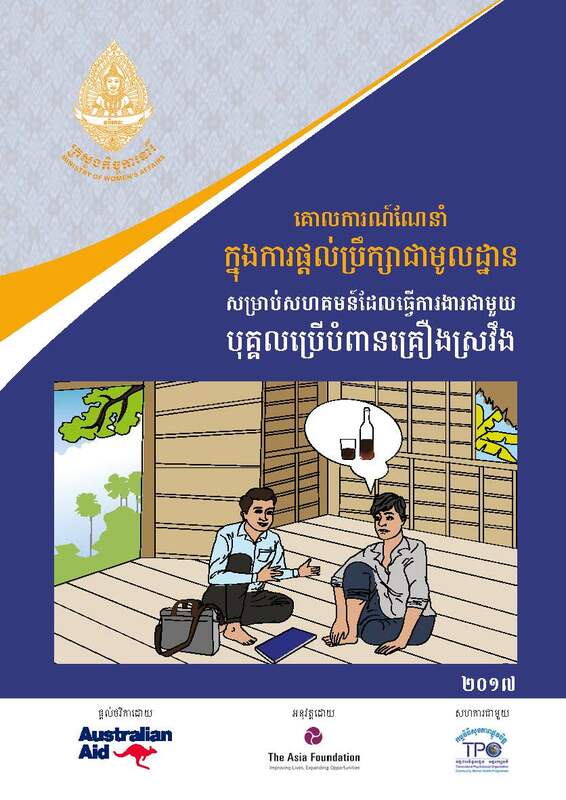 This guideline describe about characteristic of counselors and practical steps for motivating alcoholic abusers to change. The approach mentions in the guideline is motivational interviewing techniques.